I'm getting a little out of order, posting today's activities ahead of what I did yesterday, but it's my lame blog. Plus, how much are you paying to read it? Right, you get what you pay for - and today I'm feeling buzzed by today's automotive adventures. So, after letting the moto-bound Electra staff take the Mercedes Vito rental van after Eurobike, I rented a compact car to take me north to Cologne and Hamburg. 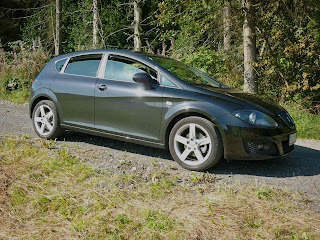 When (rental agency name not listed, you'll find out why later on) handed me the keys to a SEAT Leon (SAY-ot Lay-ON), I was curious. 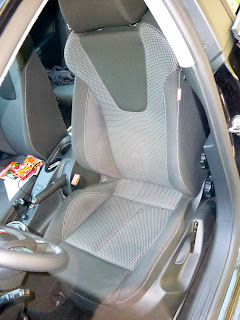 As part of the VW group, all SEATs use VW platforms. Would this Leon be a derivative of the sub-compact VW Polo? An urban runabout a-la the VW Lupo? Or the SEAT version of the VW Golf. Approaching the Leon I was happy to see that it's Golf-sized (built on the "A5" platform, also shared by the Audi A3). Three little letters on the front quarter panel also sparked some interest - TSI. This car has VW's Euro-only turbocharged, direct injection engine. Mind you it's still a small Euro motor, displacing 1.4 liters and the turbocharger's snail only offers a puff of boost. However, the 123 HP output would be adequate while delivering respectable economy. 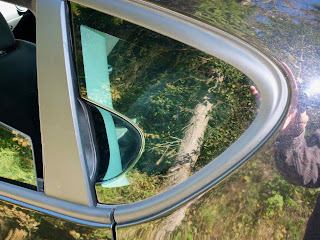 Neat design touch - plexi rear side windows with recess to access door handles. Okay, so it looks promising from the outside - the aforementioned TSI badging and 17" alloy wheels wrapped in a nice shade of Pirelli P7 W-rated rubber. How's Leon (pronounced by me as LEE-on) on the inside? 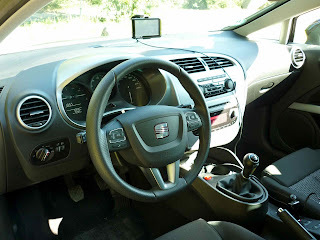 Leather-wrapped sport steering wheel and 6-speed manual transmission? Auxillary input for the stereo? Yep! This is going to be a fun ride - and no German radio (Michael Jackson 23 hours/day). Fascination Green Hell. Speed and fun on the Nordschleife. Experience the most beautiful, longest, busiest and most challenging racetrack in the world to own two or four wheels. 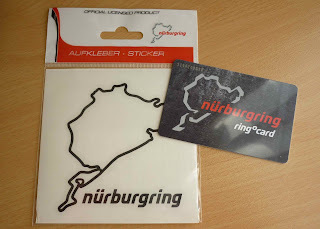 Visit the Nordschleife of the Nürburgring. Completed in 1927, this has always delighted in the unique way the human world. 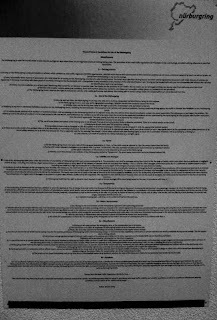 Motor sports idols such as Rudolf Caracciola, Manfred von Brauchitsch, Hermann Lang, Juan Manuel Fangio and wrote Graf Berghe von Trips, with their reckless driving history here. Jackie Stewart christened the twisty section through the spectacular scenery of the Eifel respectfully "The Green Hell". Even today, this route exerts a great fascination. 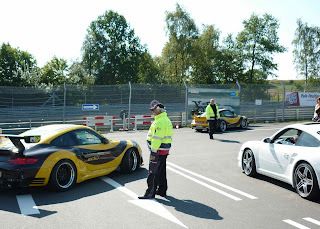 Navigate with your own car or motorcycle, the laps of the Nurburgring, which is a particular challenge. The 20.8km long route means to master the Nordschleife, his driving skills, even under high standards to assess anew. The Nordschleife is not a modern racetrack. Confusing or secluded corners, blind, treacherous hills, strong likes and differences and frequently changing road surfaces and thus make the friction Nordschleife one of the most demanding challenges for any motorsports fan. They shall also serve as the "most beautiful road in the world". The key advantage: there is no oncoming traffic that interferes with the search for the ideal line. But other road users in the context of the tourist trips, which makes the observance of some rules needed - in the interest of safety of all concerned. The drive from southern Germany was pretty gut! I was able to experience some unrestricted stretches of the Autobahn and hit a top speed of 204 kph (127 MPH) on one wide-open section. I bet I could pull a few more KMs of speed out given the opportunity. 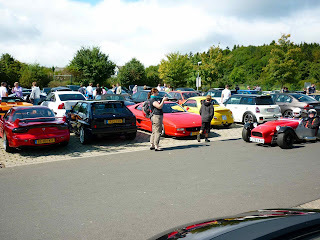 Most of the trip was cruising at about 150-160 kph along with the fantastic German drivers. Sure makes driving in the States even duller by comparison. ...to be at least somewhat familiar with it. But I was not prepared for the sensory overload of fantastic exotic machinery in spilling out of the parking lot. The Leon was the proverbial knife at a gun fight. And a toy rubber knife at best. I felt like a poseur in my sporty-looking-yet-gutless SEAT. Now this isn't a race per-se, but putting around the track, a 200 MPH supercar can fill up the mirrors pretty darn quick. Looking at all of the rides that I'd be sharing the track with (along with the safety equipment in said cars - racing seats, helmets, driving gloves, roll cages and fire extinguishers), I started getting cold feet. Maybe this wasn't such a good idea. The track was temporarily closed while they scraped a sport bike off the track. My heart sank when I saw the recovery truck tote the banged-up Suzuki through the gates. But then I spied a few older beater VWs with British plates. Surely I can share the same track as that rattle-can finish Quantum wagon, right? So I paid my €22 and bought a pass. No turning back now - I'm too cheap to piss away $30 and not get in a loop. I walked back to the car with a stomach full of rabid, flesh-eating, razor blade-covered butterflies. I was breaking a sweat even though the temps were pleasant in the upper 60s. What the hell was I doing? Okay, seatbelt buckled and snugged waaay tight. Radio off. Loose items stowed. Front windows open 1/2 way, rears opened all the way. A/C off, headlights on. Deep breath. I let a few hopped-up BMWs in ahead of me and took my place behind a battered-but-quick Opel and rolled up to the gate. Drove past the crowd (likely chuckling at the sight of the Leon) and waved my pass at the gate as if I knew what I was doing. And I'm off, rolling thru the cones at 30 kph. Once clear of the start I wrestled all 123 ponies and wound through gears 2-4. Checking my mirrors I could see a 911 approaching quickly. Stay right, turn on right indicator (meaning "I know I'm slow, I'm moving out of your way and acting as a rolling chicane"), whew. Okay, back to the task at hand. Stay focused, read the track for the "racing line" (where the rubber has been laid down by drivers with 160x the skill as I do), while keeping an eye behind me for theOHMYGODTHAT911TURBOWASFASTtraffic. Back in the clear for a while I was starting to feel more confident (thankfully not cocky). Got a few fun howling corners out of the Pirellis and settled in, keeping the SEAT in third gear for the most part, only hitting the rev limiter three or four times. Once the tires had some heat, they also had some decent grip and stopped feeling greasy. Happy that the brakes didn't fade asWOWTHATLAMBORGHINIV-12SOUNDEDGREATthey were certainly being put to the test. Okay, so I hit it at considerably less-speed, but it was stillHOWDOTHOSESPORTBIKESGOSOFAST?amazing. I actually felt a sense of relief as I passed km marker 19 - I had survived 95% of the track and remained unscathed. No time now to ball this up. The last 1.5-or-so kilometers are a "cool-down" section in what would otherwise be a wickedly-fast straightaway. Fine by me. I had enough. Parked back in the pits alongside others who had taken the same journey, the air thick with the smell of hot rubber and cooked brakes. Parched I grabbed a Coke from a vending machine and walked around to wind down. ...so I bought a sticker to go with my "Ring Card". I'm glad I did the 'Ring in this car. 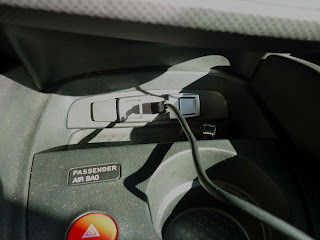 Not only because it's a thrashable rental, but because I realize that I could have gotten myself into deep, deep trouble had I been in my old WRX that had over 2x the power. Trouble deep enough to require the jaws-of-life to get out of. Oh, and my "Ring time"? - about 16 minutes. Fast production cars can get around in less than 8 minutes while Sabine Smitz ("Queen of the Ring") was able to do it in just over 10 - in a diesel delivery Ford Transit delivery truck. I intentionally didn't reset the GPS as I didn't want to egg myself on and keep a high average speed. I should also add that BMW has a "Ring Taxi" service as well. 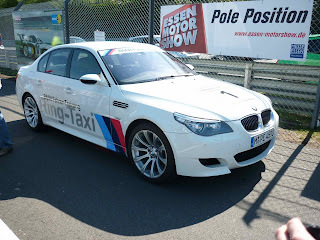 €195 for three passengers to go for a ride on the Ring with a professional driver in a 500 HP M5. That could be a great way to *really* experience the Green Hell, although it is priced a bit higher than typical taxis. Oh, and that primer-black Quantum wagon mentioned earlier? Powered by a high-output Audi motor with over 300 HP. Incredible! So cool that you took a trip around the 'ring. I am so jealous. At least you got the Leon instead of a Toledo(Jetta). But how come you didn't get your camera to record a movie? Now that is something to post to your blog. If I do it again, I'll do it "right" and rent a proper car and insurance thru an agency like Rent-Racecar.de. Just glad I pulled it off once without a hitch.